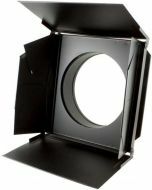 This is a 4 leaf barndoor designed for use with a 6" Altman Fresnel, a PAR 56, or any fixture with a 7.5" x 7.5" color frame slot. Barndoors are an essential accessory for any lighting system. 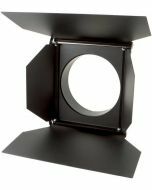 Barndoors alter the shape of light output from your lights by trimming them with soft edges, unlike the hard-edge of a focused ellipsoidal. 3.8" x 8.75" x 9"